Buddhist polemics revolve around the veracity and efficacy of doctrine and practice. It seems that from the very beginning Buddhists were involved in a struggle with non-believers to establish the Truth. What we see is a process of ultraism in which each group, including the authors of the earliest texts, is inclined to denigrate those that had come before it. So the Pali suttas ridicule Jain and other non-Buddhist teachings, the Mahayana Sutras ridicule the Arahants, and so on. The thing that seems to be driving this process is a sequence of reform movements which seek to establish, or re-establish, norms of practice in line with a set of ideals which is actually common to all Buddhist schools. Alongside this reformist agenda is a strong conservatism which constrains Buddhists to accept texts as the word of the Buddha and therefore sacrosanct. The result is that a hierarchy of ideals is built up over time. In very early Buddhist texts (such as the Dhammapada, or Sutta Nipata) an Arahant (ie one who has achieved the goal, is enlightened, completely liberated from suffering) is seen as second to the Buddha only in the sense that he led them to the goal. Their ‘state’ is ontologically undefinable, but is equivalent to that of the Buddha, ie both the Buddha and the Arahant have achieved Nirvana or final liberation. But even before the Mahayana came into being there were attempts to redefine the status of the Arahant as falling short of the goal, and capable of error. By the time the early Mahayana Sutras, such as the Lotus Sutra, the Arahant is portrayed as conceited and stubborn. The Perfection of Wisdom sutras, which span the entire development of the Mahayana, portray Arahants such as Subhuti and Sariputra as being instructed by mythic Bodhisattvas, whereas the Pali suttas have these two being the ones giving instruction. 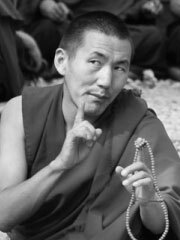 By the time the Vajrayana came into being there was already a considerable superstructure of doctrine and practice built up. But the Vajrayana was bound by the same constraints and so ended up adopting everything and trying to make sense of it. The Tibetans synthesised it all into a complex hierarchical system which has Hinayana, Mahayana, and various grades of Tantra as a towering stairlike path through which the spiritual aspirant must ascend in order to follow the Buddha. Somewhat ironically the highest levels of Tantric practice, such as Dzog Chen starts to resemble the simple mindfulness of the Pali Canon. Similarly in East Asian Vajrayana Kukai adopted a hierarchical structure for the various teachings, in which the Hinayana and Mahayana both rated as merely provisional teachings which were not effective in attaining enlightenment. It is difficult to know what to make of this building of ever higher teachings, and more secret practices. If one accepts the Pali Canon as evidence (and most Buddhists would) then there is ample evidence that the so-called ‘Hinayana’ practices were efficacious. It is also clear that an Arahant was definitely one who had attained the goal set out by the Buddha. The differences between the Arahant Ideal (as the Mahayana designates the Hinayana goal), and the Bodhisattva Ideal (as the Mahayana designated itself) are not so much differences in goal or aim, as they are differences of emphasis — one emphasising the subjective, internal transformation of self; the other emphasising the altruistic, other regarding aspects of the teachings.